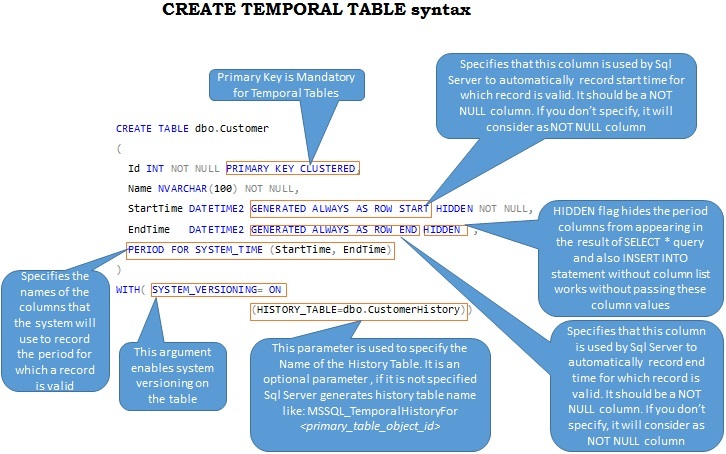 This is the second article in the series of articles on the Temporal Tables, below is the complete list of articles on System-Versioned Temporal Tables. This article covers the querying of the Temporal tables by new temporal querying clause FOR SYSTEM_TIME and its five sub-clauses in the SELECT…FROM construct. This construct simplifies the querying of the History data and hides the complexity from the users. 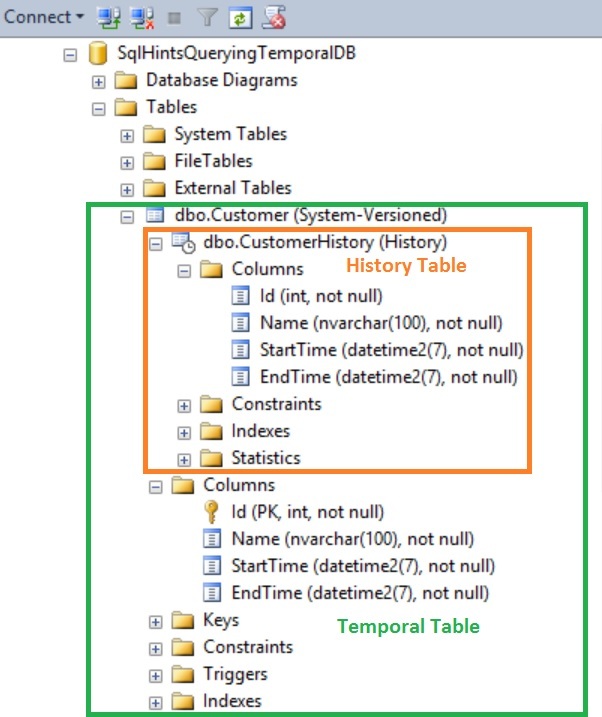 Even though the temporal table data exists in two tables one is the current table and other is the history table, this construct hides all the complexity of fetching data from these two tables. Here I am keeping a delay of 2 minutes between each DML operations by using the WAITFOR DELAY statement. Let us try to get the state of the data that was valid at ‘2015-12-29 07:51’. This point-in-time in the past is depicted in the below milestone graph by Yellow milestone point circle. Below is the execution plan of this query execution. 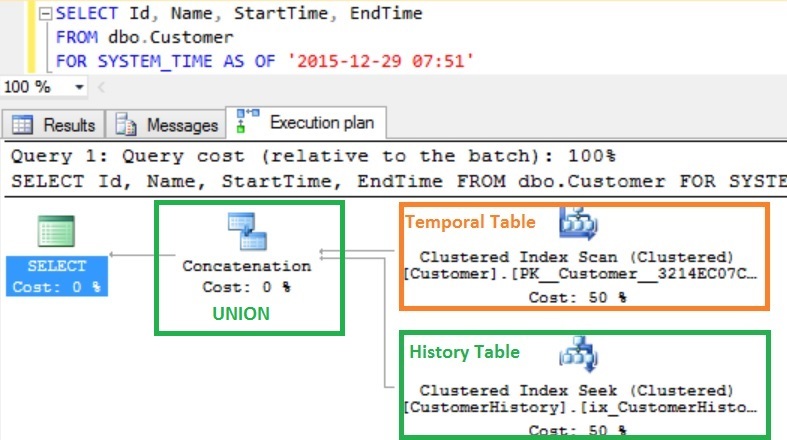 From the execution plan we can see that the FOR SYSTEM_TIME AS OF clause internally retrieving the data from both the Temporal Table and History Table and returning the UNION of the results from both the tables. 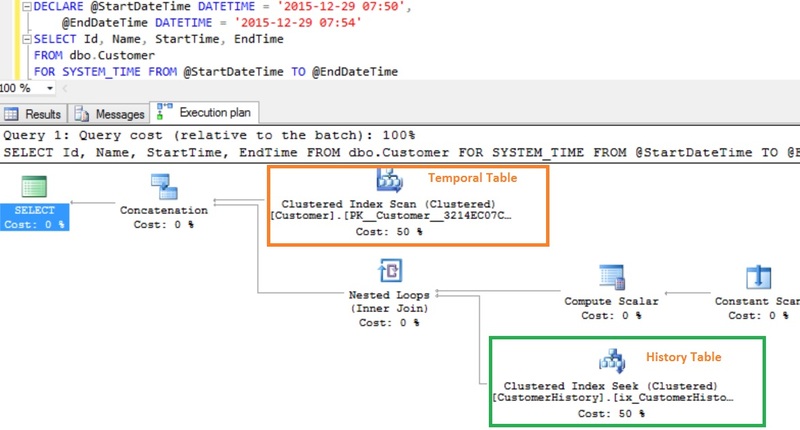 One more observation from the execution plan is that on the temporal table we seeing Clustered Index scan, it is because our queries filter predicate is based on the Period columns but we don’t have index on these columns. 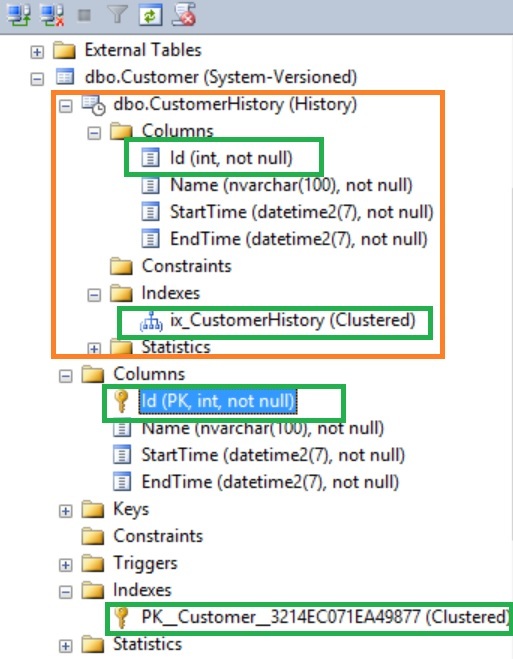 So if we know that we are going to query by the Period columns it is better to add an index on these columns and by default Sql Server is adding an index on the period columns in the History table. 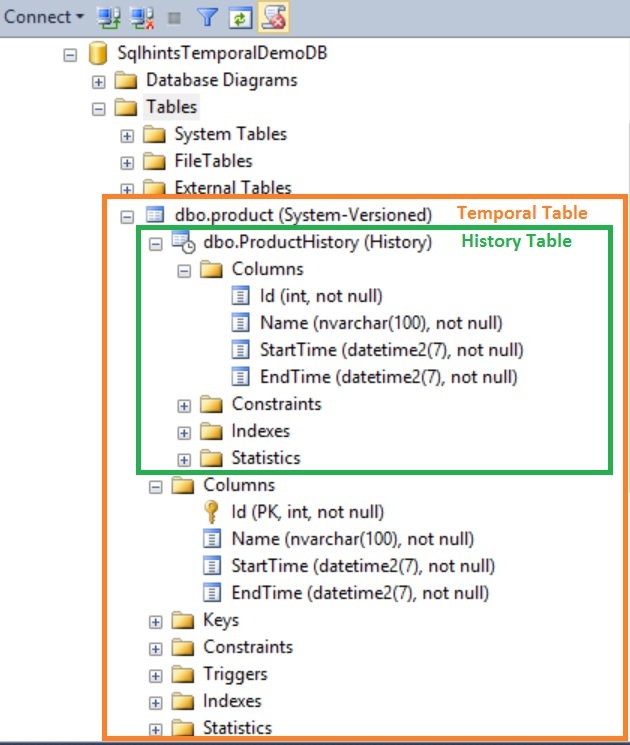 System versioned temporal table ‘ SqlhintsTemporalDemoDB.dbo.Customer’ must have primary key defined. Table needs to have two DATETIME2 columns representing the start and end of the row’s validity period. We can mark these period columns as HIDDEN, if we mark them as HIDDEN then these columns will not appear in the result of query and also INSERT INTO statement without column list works without passing these column values in the values list. 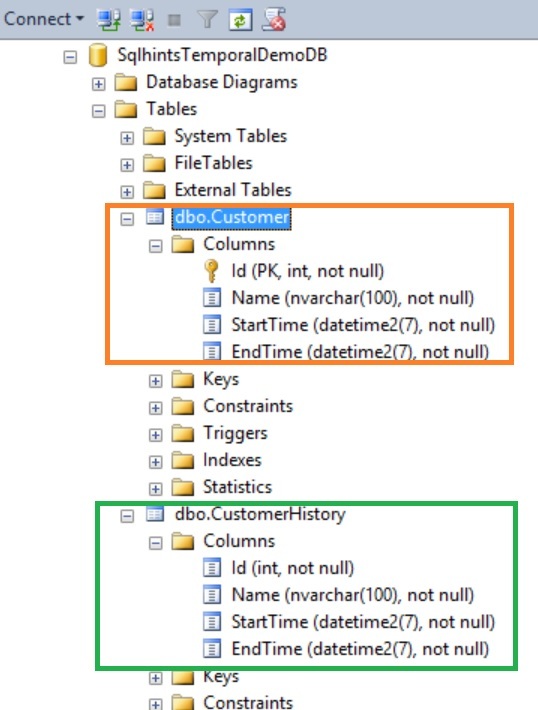 So this HIDDEN flag makes the enabling of the System Verionsed tables completely transparent to the users/application. It means the application will continue to work and behave functionally as it was previously without needing any changes in it. 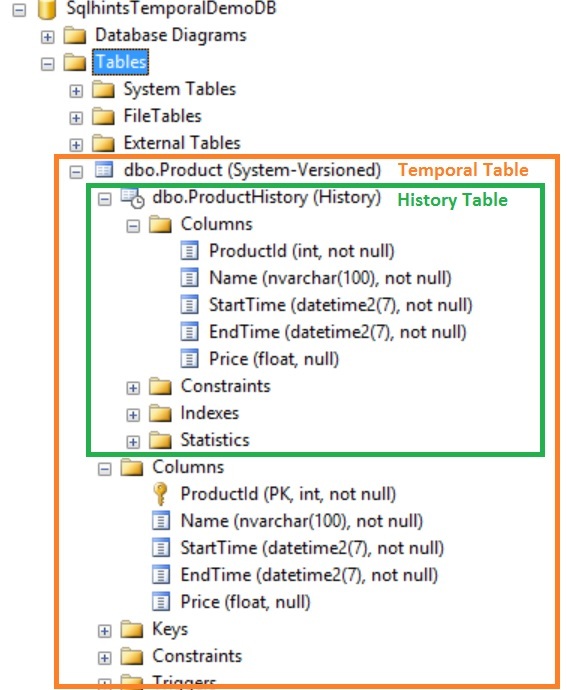 HISTORY_TABLE : This parameter is used to specify the Name of the History Table. 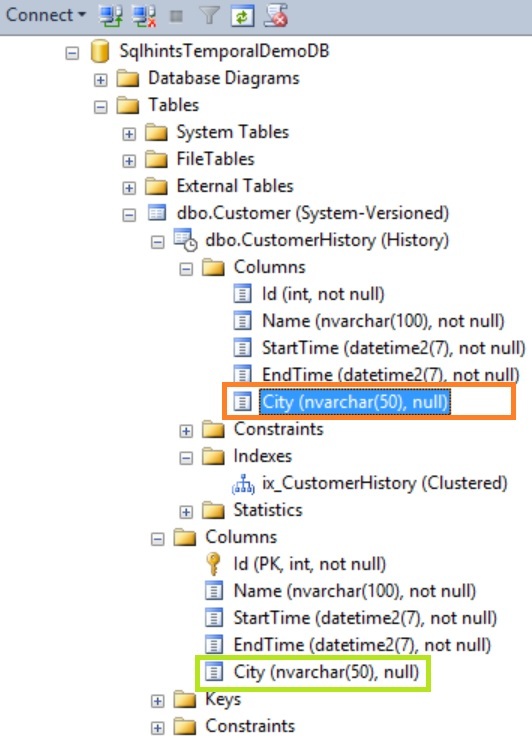 It can be an existing table name whose schema matches with the current/Temporal table or it can be new table name which Sql Server will create. Let us now understand one by one the DML INSERT, UPDDATE and DELETE operations on the Temporal Table. 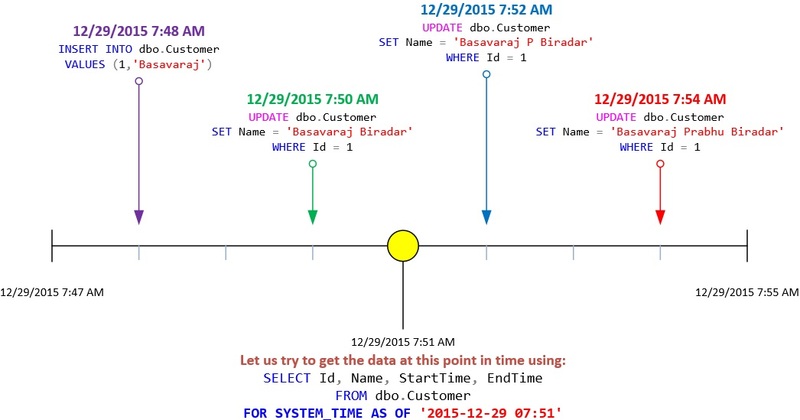 The above statement worked even though we have not specified StartTime and EndTime column values. It worked because we have marked these two columns as HIDDEN, otherwise it would have failed. If these columns were not specified as HIDDEN in that case we need to pass these two column values as DEFAULT in the values clause. From the above results execution plan, we can see that the record is inserted only in the Temporal/Main table dbo.Customer only. From the above result we can say that INSERT operation will insert record only in the current (i.e. Temporal) table only, it will not insert the record in the history table. Also we can observe that even though we have written our queries as SELECT *, still it did not return the period columns StartTime and EndTime of the Temporal Table as these columns are marked as HIDDEN. If we need to get these columns in the result we need to specify them explicitly in the SELECT statement as in the following statement. 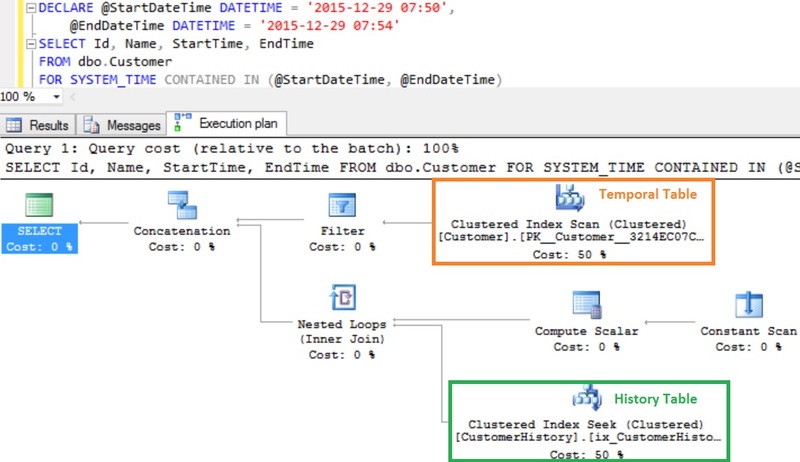 From the result we can see that Sql Server is recording the Period StartTime column with a datetime value which is present at the time of the execution of the statement and as this record is still open (i.e. 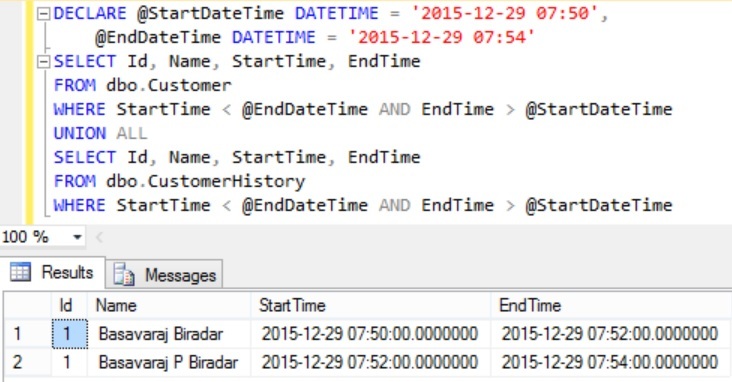 still active) so the EndTime populated by the Sql Server is the DATETIME2 max value i.e. 9999-12-31 23:59:59.9999999. 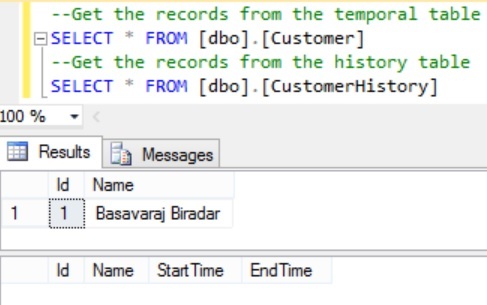 From the execution plan, we can see that first it is updating the record in the dbo.Customer table and then Sql server is inserting a record in the dbo.CustomerHistory table. From the result we can see that update of a record in the temporal table results in inserting the record in the History table with state of the record before update and endtime will be the time at which the update statement is executed. And the Temporal (i.e. current/Main) table will have the updated row with starttime as the time at which the update statement is executed and as this record is still active it will have endtime as DATETIME2 data types max value. From the result it is clear that we can’t update the PERIOD column values when SYSTEM_VERSIONING is ON. TO do this we need to first disable the system versioning and then drop the PERIOD definition from the Customer table. Then these two tables will become like any other regular tables and we can perform any operations on it. 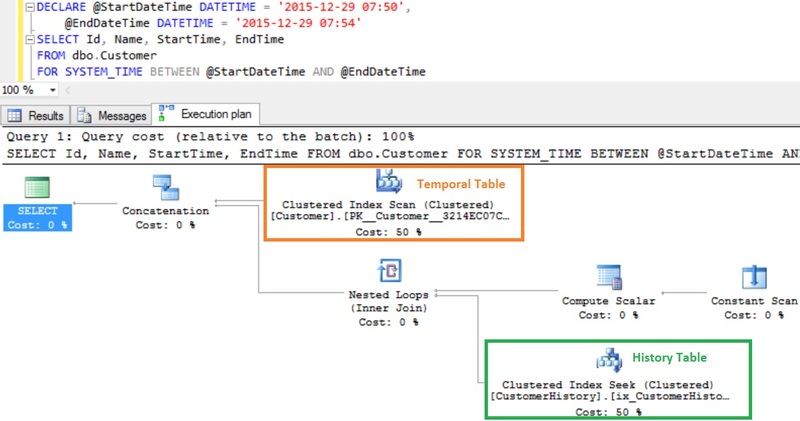 From the execution plan we can see that Sql Server is deleting the record from the Temporal Table i.e. 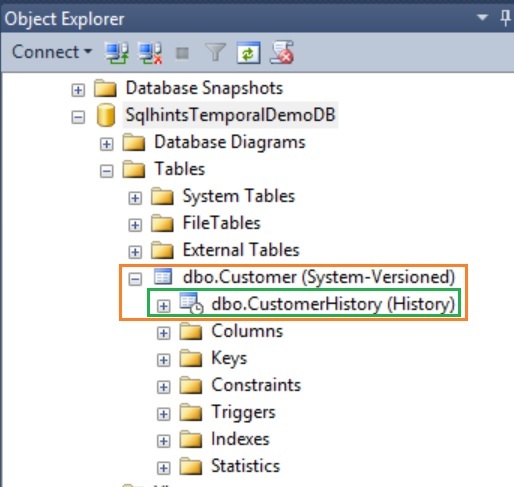 dbo.Customer and Inserting the deleted record in the History table dbo.CustomerHistory. From the results we can see that the record is deleted from the Temporal table and the state of the record before delete is stored in the History table with endtime of the record as the DELETE statement execution time. Truncate failed on table ‘SqlhintsTemporalDemoDB.dbo.Customer’ because it is not supported operation on system-versioned tables. 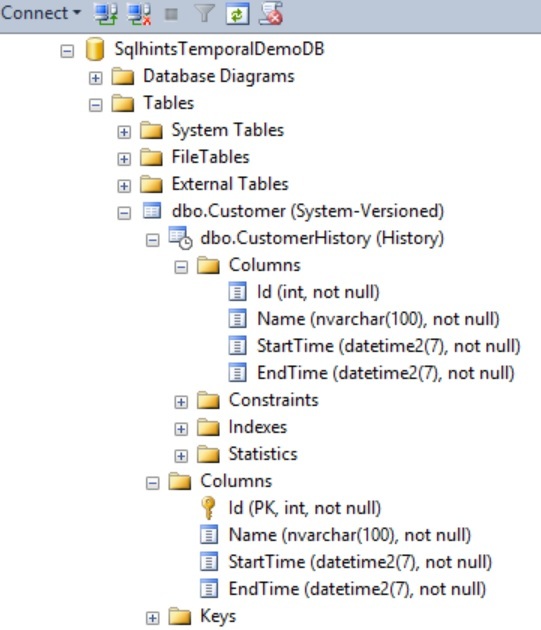 Cannot delete rows from a temporal history table ‘SqlhintsTemporalDemoDB.dbo.CustomerHistory’.